Stay tuned for upcoming events for Mooroo Live in near future. 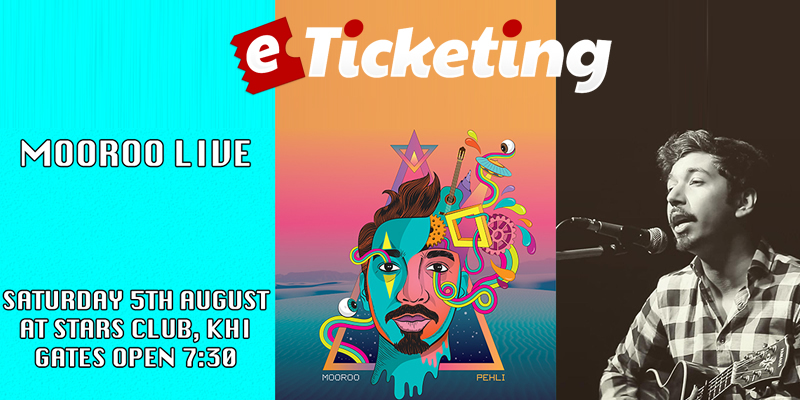 Mooroo Live, a musical night will be held on 5th August 2017 at Stars Club, Karachi. Taimoor Moeen Salahuddin also known as Mooroo is a Pakistani entertainer, singer-songwriter, actor, director, producer and vlogger. Lineup of Mooroo's band includes Jasir Abro (Bass), Hamad Khan (Guitar), Lenny Massey (Keys) and Ajay Harry (Drums). Mooroo and his band will perform songs from Mooroo's debut album "Pehli". People in Karachi and nearby cities come and enjoy a melodious Saturday evening. Seats are limited, so hurry up. Check back soon, if Tickets get sold-out. Taimoor Salahuddin better known by his stage name Mooroo (Urdu: مورو‎) is a Pakistani entertainer, singer-songwriter, actor, director, producer and vlogger. Since the beginning of his career in 2011, his songs or music videos has been nominated for Lux Style Awards five times, winning it once in 2016. He is also co-founded and managing director of Karachi-based production company Aflatoon Studios. Terms & Conditions : No Smoking Indoors. Have Fun. Best Viewed at 1024 x 768 pixels and above. This Page loaded in 0.0643 seconds on Tue, Apr 23, 2019 (21:21).